In Chronicle number one of "The Church of God" series we saw that believers are given two sets of instructions: one, concerning something they were in; and two, concerning the place where God lives. In the OT, they were in the land of promise which was their gift from God, and then they came to the temple at Jerusalem where God was. In the NT, believers are in Christ through the gift of the Spirit of promise, and as God’s living temple of Christians come together in one place where Jesus the Lord is: the local church. We saw in chronicle #2 that there was to be a gathering center, a place where was the name of the Lord Jesus Christ alone: the NT house of God. The term "Name" has to do with God’s presence and conveys authority, unity and glory unto Him. In Chronicle #3 we saw that in the place of God’s dwelling one learns the fear of God by being in His holy presence and observing His ways. It was also where the best is reserved for God. In our study so far we have progressed to the fifth major activity in the house of God which is highlighted below. Thou shalt therefore sacrifice the passover unto the LORD thy God, of the flock and the herd, in the place which the LORD shall choose to place his name there. … that thou mayest remember the day when thou camest forth out of the land of Egypt all the days of thy life (Deu. 16: 2,3). In Deuteronomy 16:1-8 the subject of celebrating Passover at God’s place is brought before us. What the passover was to Israel, the Lord’s Supper (breaking of bread, communion) is to the church. Not only is the ordinance of passover taught in the Old Testament, but also its character. Character is the manner, style, or way it is to be done in order to be compatible with the desires and nature of God. For example, if you tell a child to wash the car, you not only want it to be clean but you also care how it gets clean. You don’t want him to wash it with sewer water or a scouring pad. Seven characteristics were to accompany Passover. Understanding Passover’s character will shed light on the keeping of the Lord’s supper. We will look at both in the following characteristics. Passover – Who was to partake of it? Keep the passover unto the LORD thy God: for … the LORD thy God brought thee forth out of Egypt by night (16:1). The instructions for passover were not given internationally but only to those who experienced the deliverance from Egypt. Israel had been redeemed (delivered) by the blood of the lamb and through the waters of the Red Sea. God had made it clear that "no uncircumcised person shall eat thereof" (Ex. 12:48). Circumcision was the sign of a covenant relationship with God. Passover participation was limited to the redeemed. Lord’s Supper – Who is to partake of it? Unto the church of God which is at Corinth, to them that are sanctified in Christ Jesus, called to be saints, with all that in every place call upon the name of Jesus Christ our Lord, both theirs and ours (1Cor 1:2). The instructions for the Lord’s Supper are given to those "in Christ Jesus," not the world at large. It is limited to those who have been redeemed by the blood of the Lamb (the Lord Jesus) and have declared so with the confession of water baptism like the Corinthians did (Acts 18:8, 2:42,42). How can you remember someone you have never met? When 1Cor. 11:28 tells a man to "examine himself, and so let him eat" it is not talking about any person deciding for himself if he has the right to the Lord’s Supper. It is to someone already saved and in the church to be sure he knows what he’s doing. A church is not being legalistic but rather godly when it limits the Lord’s Supper to the redeemed who confess the Lord Jesus. Passover – What was it for? Keep the passover unto the LORD thy God: … sacrifice the passover unto the LORD thy God (16:1, 2). Though God’s people participated in the memorial of passover it was to be "unto the Lord." It was not designed to please Egypt, the world nor even Israel. It was for the delights of God’s heart to see His people delivered and thankful unto Him. It was called the "Lord’s Passover" (Ex. 12:11) not the people’s passover. Lord’s Supper – What is it for? The Corinthians were guilty of misunderstanding and so the Lord’s apostle called it their "own supper" rather than "the Lord’s Supper." They were using the assembling time for their own social, emotional and physical needs. The apostle has to point them away from self and show that they were to focus on the Lord and what He did for them. Some things are for God and God alone. It is His supper, not ours. The Lord’s supper and the church are not designed to be user-friendly or seeker-sensitive – but unto Him. Passover – What was the main activity? Thou shalt therefore sacrifice the passover unto the LORD thy God, of the flock and the herd … And thou shalt roast it and eat it (16:2, 7). Israel was not to focus here on teaching, personal problems, victories or the proselytizing of Gentiles but the eating of a sacrificed lamb. Simple, but this memorial lamb spoke volumes. It was the blood of the spotless lamb that was put on their doors, which when God saw, He "passed over," sheltering them from judgment. Passover drew them back to the source of their national salvation to honor God alone as their Savior. Lord’s Supper – What is the main activity? For as often as ye eat this bread, and drink this cup, ye do show the Lord’s death till He come (1Cor 11:26). The Lord’s Supper involves taking bread and wine (the cup). It’s not occupied with entertaining dramatizations, musical performances or dynamic sermons, but the Lord and His death. Here there is liberty for the men (orally) and women (silently) to worship and thank God for His great salvation and Savior (1Cor. 14). Till He come we take the bread, Type of Him on whom we feed, Him who liveth and was dead! We give thee thanks O Lord. Till He come we take the cup; As we at His table sup, Eye and heart are lifted up! We give thee thanks O Lord. Passover – Why was it done? God designed this feast for a remembrance or a memorial. "This day shall be unto you for a memorial" (Ex. 12:14). God wanted to keep before His people their deliverance. This recollection of the past was meant to keep them focused on their Savior and Sustainer. Lord’s Supper – Why is it done? The Lord’s Supper does not re-sacrifice Christ or help obtain salvation any more than observing Memorial Day wins a battle that soldiers fought 200 years before. Observing the Lord’s supper does more than jog our memory. It is an act of remembrance – which induces a memorial. One observes Memorial Day not just to remember that soldiers died, but to honor them. One goes and speaks at a memorial service not to be reminded a loved one died but to honor them. Partaking of the Lord’s supper is the remembrance of the Lord Jesus that He requested. Thus He is honored in the portrayal of His great sacrifice. Passover – Where was it observed? When Israel settled in the land of their inheritance God chose a place where His presence and Name would be. 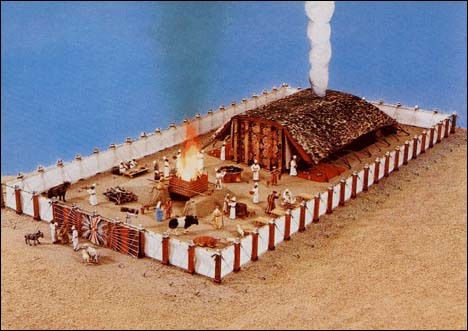 First it was the tabernacle in Shiloh and then it became the permanent temple in Jerusalem. Israel did not have the liberty of individually expressing their remembrance to God in a place that was closer, or more convenient for the family. They were not to go to the place of their choice but the place of God’s choice. There, at the place of God’s dwelling, they would remember the Lord’s deliverance in Passover. At God’s house would be a collective gathering which, along with the priesthood, would preserve the feast from being corrupted unto the Lord. Worship is sacrificial and has feet to it. God wants His people to come together. Lord’s Supper – Where is it observed? When the Corinthian believers would come together in one place they were the assembly (church) and temple of God. There, God’s presence dwelt among them collectively. There, they owned and called upon the Name that God chose, the Lord Jesus Christ. There, would be the liberty of the priesthood of all believers to function in the assembly (1Cor. 1, 3, 14). Only in the collective church setting does the NT epistles show the Lord’s supper observed. Yes, it is a "sacrifice" to come together. But there is a gospel dynamic when believers of all backgrounds, together glorify the Lord with one mouth and one mind (Rom. 15:6). Passover – How was it observed? Yes, the lamb was to be sacrificed and eaten. But did it matter to God how it was eaten? It did. The Lord specifically commanded that there was to be no leaven (yeast) in the bread eaten with the lamb at the feast. The feast was to be leaven-free. Of course, yeast is something that spreads and permeates the whole. It is a picture of sin. Therefore, His people were reminded to be set apart from sin as the Lord is. Lord’s Supper – How is it observed? In the New Testament it is not the literal leaven the Lord is concerned about at the feast, but what the leaven represents: sin. The feast is not Israel’s passover but the fulfillment of it in church life. The assembly who owns "Christ our passover" is to be sin-free, like Him. The Corinthian assembly was glorying in the liberty of grace and love but ignoring a sinning believer in the fellowship. The Lord’s apostle said their glorying was not good. Rather than glorying they should have mourned. The godly solution was to excommunicate the sinning person (until repentance, 2Cor. 2). This act was viewed as removing leaven from the feast – the leaven of malice and wickedness. Thus the feast would now be unleavened with sincerity and truth (1Cor. 5). It is possible to be eligible for God’s heaven by the gospel, but not be holy enough for fellowship in God’s church because of its testimony unto the Lord on earth. Passover – When was it observed? It was God who decided when passover remembrance would be kept. The people’s choice did not enter into it. The time would coincide with the time of year God delivered them and the time of day. It was in the evening the spotless lamb was slain and the blood applied (Ex. 12:6, 21, 22). And so the congregation would collectively sacrifice the passover at evening. Lord’s Supper – When is it observed? It was at the end of the sabbath, at the dawning of the first day of the week when the crucified Lord Jesus rose from the dead: the dawning of a new age. It is on this day God records that the New Testament believers in various cities assembled together in one place to remember Him and edify one another (Acts 20:7, 1Cor. 16:2). Notice in John 20:19 that the disciples assembled on the first day (Lk. 23:33-36). It was at that precise time the risen Lord chose to come in their midst and reveal Himself. However, Thomas was missing and thus received no understanding and fell behind the others. He did not get more understanding until the following first day. May you be encouraged to remember Him–His way. Is the Lord Jesus Christ worth it?